The VFL Magpies head out onto Olympic Park Oval for Sunday's practice match. Photo: Shane Barrie. Collingwood opened its VFL campaign for season 2014 with a 15-point win over Port Melbourne in a practice match at Olympic Park Oval on Sunday. The Magpies welcomed back senior pair Ben Sinclair and Jarrod Witts from shoulder surgery, while rookies Peter Yagmoor and Jonathon Marsh played their second game of the weekend after featuring as substitutes in the senior side's NAB Challenge loss to Richmond 24 hours prior. 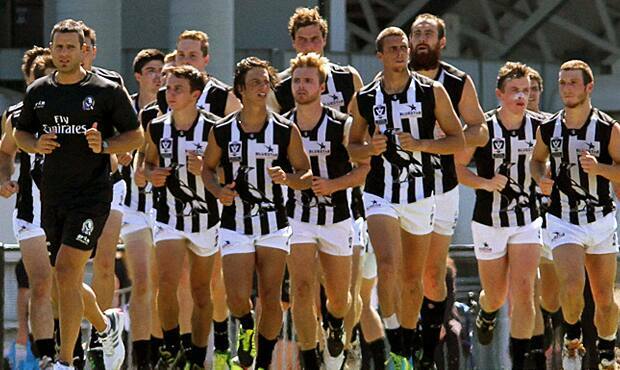 Ruckman Ben Hudson rounded out the senior side's representation on a day in which the VFL listed Magpies shone. Witts was named best afield by the coaching staff but it was the form of Jake Williams that caught the eye. Williams, who signed on as a VFL Magpie only a few days prior to the match, put in an eye catching performance in the midfield and his penetrating left foot regularly caught his opponents off guard. Sinclair performed strongly in defence and occasionally through the midfield, while Ryan Pendlebury, Scott's younger brother, began the day well in defence.